Drinking and driving in Canada has undoubtedly been on the decline over the last quarter century. While over 800 Canadians per year are injured by a drunk driver, that figure is just half of what it was in the 1980s, and continues a sharp downward trend. But with over 120 deaths and 800 injuries attributed to drinking and driving in Canada as recently as 2011, impaired driving remains a stubborn scourge, particularly in certain areas of the country. 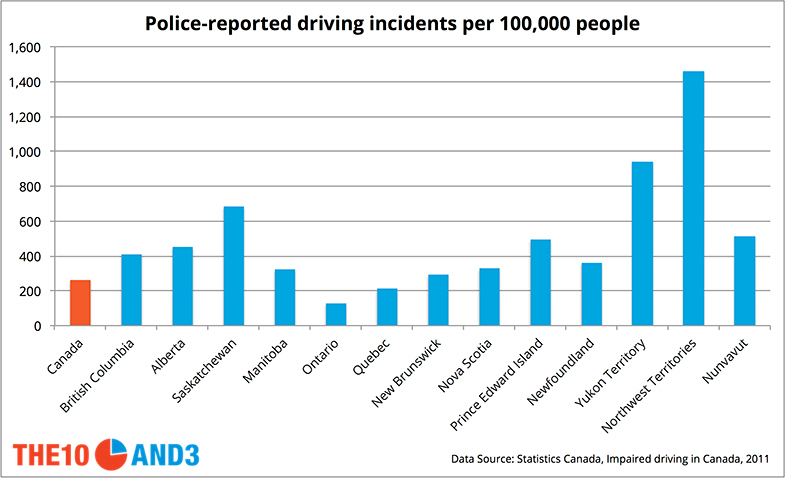 Outside of the northern territories, Saskatchewan and Prince Edward Island hold the dubious distinction of having the most police-reported impaired driving incidents in the nation, approximately doubling the Canadian average. With alcohol considered a factor in almost 30% of deaths from vehicle crashes in the most recent national statistics, the two provinces’ increased efforts to enact stricter laws and harsher penalties could not come soon enough. In Saskatchewan, drinking and driving has been described as simply being part of the province’s “culture,” one that claims the lives of dozens, mostly young people, each year. With thousands of kilometres of rural highways and roads, the province’s police struggle to intercept even a modest fraction of the impaired driving activity in Saskatchewan. But the province’s leadership has finally decided to take action. Starting January 1, 2017, the “zero-tolerance” age for young drivers will rise from 18 to 21 (meaning any blood alcohol level, even below 0.08%, results in an immediate 60-day license suspension), while for all other drivers a blood alcohol level measured between 0.04% and 0.08% results in a 3-day vehicle seizure. Outside of the picturesque province, PEI is perceived as an idyllic, pastoral escape from the hustle and bustle of bigger cities and towns in Atlantic Canada and all points west. But inside, Islanders know all too well that drinking and driving remains a stubborn, deadly problem in the province. With a steady parade of drunk and drug-impaired drivers filling Charlottetown’s court system on a daily basis, the province was moved to introduce a harsher set of laws to help stem the tide. First-time offenders are required to have ignition interlocks installed (which require a breathalyzer-like test before the vehicle can be started), while second time offenders are sentenced to a minimum 30-day jail term and have their license suspended for 3 years. While the numbers in Saskatchewan and PEI are alarming, drinking and driving rates in the Territories suggest a downright public health emergency. Yukon and Northwest Territories, with police-reported drinking and driving incidents at more than three and five times the national average, respectively, continue to struggle with implementing effective legislation to stem the tide. With high rates of alcohol consumption and rural populations that heavily depend on cars to get around, political parties in the Territories differ on the most appropriate solution. In the Yukon, the NDP and Liberals have suggested far more aggressive rules on impounding vehicles and suspending offender’s licenses, while the Yukon Party favors an approach of hefty fines and increased education while allowing offenders to keep their vehicles.